Lloyd’s Register. The Code of Practice for Large Commercial Sailing and Motor vessels. Port of Registration is George Town, Cayman Islands. Full height raised and fielded cherry wall panels. Deck heads are leather. lnterior soles are carpet and en-suite cherry timber with wenge detail. Counter tops shower walls and soles are marble while galley countertops are granite. Five spreader Marten Spars 60m main mast 45m mizzen mast and Leusure furl booms are constructed from carbon fibre. Painted in Fleet white. Discontinuous Navtec rod rigging. The main sail and mizzen are fully battened with the Leisure furl in-boom furling and reefing systems. The shroud attachments and forestay fittings are recessed below decks. North Sails New Zealand built the inventory of Spectra working sails and Vela 2000 of Palma Majorca the reacher and gennaker. 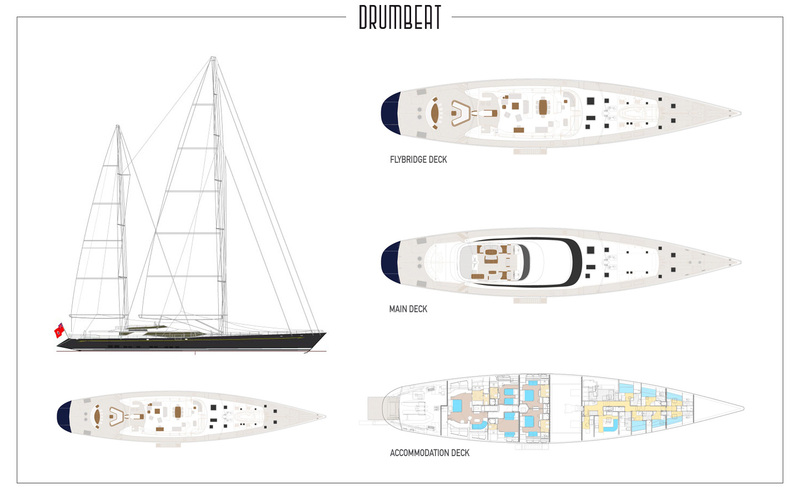 Dowm wind the yacht has a sail area of 26,000ft2 (2,400m2). All sails are hydraulically reefed or furled and controlled by 13 Alloy Yachts custom designed active reel winches. Head sails are fitted to carbon foils and operated by Reckman furlers. Lewmar hydraulic winches are used for docking lines and controlling the gennaker. Hull, deck and superstructure are welded aluminium construction. The fin bulb keel is an elliptical section and is filed with 91 tonnes of lead. Total fuel capacity 49,000 litres (10,800 imp gal or 12,900 US gal) giving a range of 8,000 nautical miles at 10 knots. 4 water tanks with a total capacity of 10,000 litres (2,200 imp gal or 2,640 US gal). The unique transom opens hydraulically to form either a swim platform or a boarding platform 800mm above water level. The transom can be lowered to 300mm in calm water. Sixteen underwater lights are fitted into the hull. A Castoldi 6.2m rigid inflatable tender with a jet unit is reversed stowed on the foredeck in a tender well, which if fitted with a flexible canvas cover. The Avon 4.5m crew tender stowed in the lazarette. Dual steering positions with custom built laminated teak and holly wheels with carbon fibre faced spokes. In the centre of the console are the sailing controls. Aft of the steering position is a dining area with barbecue, ice maker, refrigerator and a large sunpad area. A unique design feature is the layout on one level from cockpit through the saloon and dining area to the forward wheelhouse, thus creating an expansive area for entertaining. To starboard is the inside steering and navigation station with auto pilot and engine controls. The station as fitted with an elevating two seater helm seat. Extremely spacious full width owners’ stateroom with king sized bed, en suite bathroom with bath and shower. Walk-in closet, with ample clothes storage separate seating area, desk and state of the art entertainment systems. Guest cabins include 2 identical double cabins, with seating and en-suite bathrooms. A further twin cabin and the 5th cabin which is currently used as a gymnasium, has 2 pullman berths and a fixed berth, all with en-suite facilities. 6 crew cabins with shared or individual en-suites. The crew mess has its own icemaker, microwave, dishwasher and fridge.